Paul Krugman points out in his latest blog post that Mark Thoma, a professor of economics at University of Oregon, and David Altig, senior vice president at the Atlanta Fed, are both way off base to react to Arthur Laffer’s assertion that the unprecedented expansion in the monetary base (see chart below) will ultimately result in huge inflationary pressures. Nearly all of the 2008-2009 increase in monetary base has come as excess reserves. But these are piling up because the Fed now pays more interest on such reserves than the Treasury pays on t-bills. So banks dump t-bills and place money at the Fed. This is the equivalent of open market sales, except they are undertaken by commercial banks rather than by the Fed. There has been little change in cash or in required reserves since the Fed began its quantitative easing, or whatever they call it. This is no evidence whatever of a “liquidity trap” — it is evidence that the Fed has utterly failed to provide additional liquidity. 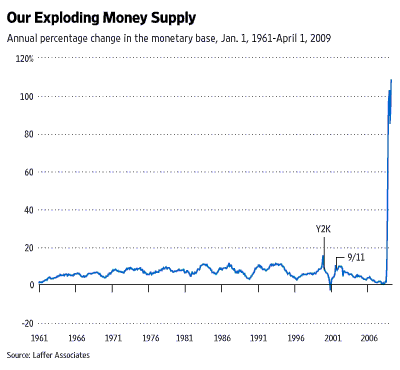 Indeed, it is evidence that the Fed has not even tried to provide additional liquidity. 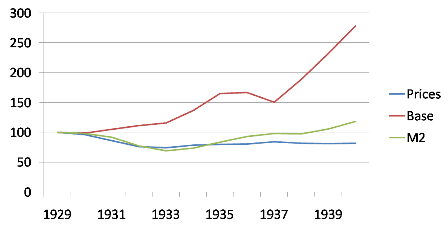 Similarly, the sharp increase in reserves beginning in 1936 and reflects a rise in reserve requirements that year, and reinforced the following year. 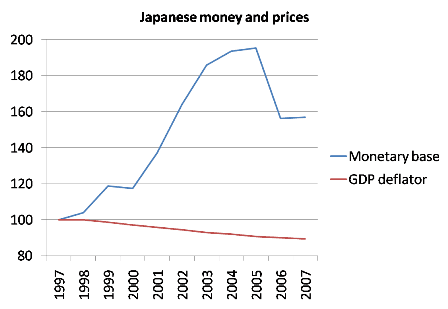 This is evidence of contractionary monetary policy, not of a liquidity trap. By the way, Friedman usually used a narrow definition of money rather than a broad one.